Porter's decision came after a WBSC Interim Board Meeting concluded here and came just a matter of hours after a WBSC spokesman had informed insidethegames both men would be running for the President's role during elections tomorrow. However, speaking to insidethegames shortly after the Board meeting in this seaside resort in Tunisia concluded, Porter, revealed he had decided to stand down from the election, claiming Fraccari was the best man to lead baseball and softball forward after the International Softball Federation (ISF) and International Baseball Federation (IBAF) merged in 2012. "Riccardo and I have worked together for a very long time and very closely particularly since our sports merged together," said Porter, who had been acting as co-President of the WBSC alongside Italian Fraccari, who also leads the IBAF. "We are good friends but the feeling is that we can only have one President. "And you know my thing is that I have retired from softball last year as President and served my time. "And thinking about it, I think the best thing is for Riccardo to continue the work that is necessary. "I really feel now that it is time to step back. "I served 26 years as President of the ISF and I was secretary general for 20 years prior to that. "I think it is best to have one person to support and move ahead with the leadership in the WBSC and I feel that is Riccardo. "As I said we have been good friends for a long time and along the way there has been some difficult times [especially when] some of our members didn't want to merge and we had to convince them to do that in the interests of our sports. "I think it is the best thing to do." The 83-year-old Porter stood down as President of the ISF last October following a reign which saw softball's debut in the Olympics at Atlanta 1996 only for it to be controversially voted off again by the International Olympic Committee (IOC) at its 2005 Session in Singapore and dropped after Beijing 2008, along with baseball, which had made its Games debut at Barcelona 1992. Since then, softball has made two unsuccessful attempts to regain its place, most recently at the IOC Session in Buenos Aires last September when it finished second behind wrestling, which had been recommended for exclusion after Rio 2016 by the ruling Executive Board only to mount a successful challenge to retain its place for Tokyo 2020. Porter revealed he had been torn between whether to contest the election or not but his final decision to stand down was made in the interests of cementing the relationship between the two sports. "Our members thought that it was best to have two candidates and I respect that but the reality is that I think Riccardo is in a better position age-wise and health-wise to do what we gotta be doing and I will support him wherever I can," he said. "We had a long Board meeting to iron out some issues for us going forward and we wanted to get any contentious issues out of the way. "We have got our sports together and we are partners and we do not want to do anything that might divide what we are trying to do which is ultimately to get back into the Olympic programme." The formation of the WBSC was an attempt to increase the prospect of baseball and softball getting back on the Olympic programme for Tokyo 2020 and despite missing out again, Porter is adamant Fraccari can lead the sports back onto the Olympic stage. "I think Riccardo is the man now," added Porter. "He has got the ability and the experience and the know-how to push us ahead." 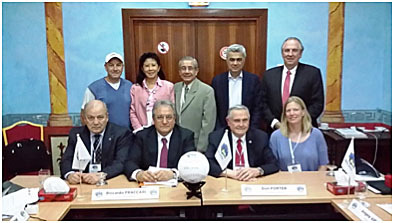 President of the IBAF since 2009, 65-year-old Fraccari described Porter as "Mr Softball" and told insidethegames he is ready for the task of leading the WBSC as he gets set to be confirmed as its inaugural sole President tomorrow here. "I was talking with Don and he told me that he wanted to leave the organisation in good hands and in his opinion it was the right moment to change," he said. "I think because of my experience in Italy where I am President of baseball and softball means that I can understand the issues of both sports fearing losing their identity. "I think Don knows that I understand exactly the things to do with softball. "But always I guarantee the equality of both sports. "And I think this will send a message to the IOC that softball and baseball are strong together. "I fully recognise that this is a big responsibility now that I have on my shoulders."